AN EXPERT committee, formed by the Ministry of Panchayati Raj, has recommended that trade control of tendu leaves, critical for forest dwellers’ income, should vest in the state. The panel, headed by agriculture economist T Haque, was set up to ensure ownership rights of forest dwellers over minor forest produce (MFP) and fix their minimum support price (MSP) in tribal areas. In its interim report, the committee argued that individual gatherers cannot be given MSP on tendu leaves as they sell only small quantities. It also said it is difficult to give them trade rights as they cannot add value to the produce. At present, tendu leaves are improved in stages by state government agencies. Giving individuals the right to sell MFP and fixing MSP on them would have substantially improved their financial condition. Almost 275 million people in rural India, a majority of them tribals, depend on MFP. The Panchayat Extension to Scheduled Areas Act, 1996, and the Forest Rights Act (FRA), 2006, entrust the rights of MFP with the gram sabha and the forest dwellers respectively. 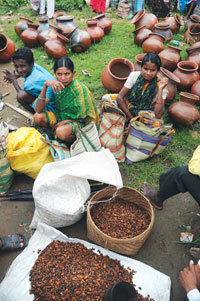 But in most states, the government controls the trade of major MFPs such as tendu leaves, sal seeds and mahua flowers. Forest dwellers are mere gatherers. (See ‘Major battle over minor produce’, Down To Earth, November 1-15). The panel was to give its recommendations on bamboo, too, but is divided on the issue. Its final report is expected by March end. Bamboo has not even been recognised as an MFP by states. Formed in August last year, the committee comprises officials from the ministries of environment, tribal affairs and panchayati raj, besides representatives of non-profits. State forest departments and some official members have opposed giving ownership rights over tendu leaves and bamboo to individual gatherers, a source in the committee said. The lucrative tendu leaves trade forms a major part of a states’ revenue. The Madhya Pradesh government alone earns over Rs 200 crore per year from the sale of tendu leaves. Madhya Pradesh, Chhattisgarh, Andhra Pradesh, Odisha and Maharashtra together earn up to Rs 82 crore a year from bamboo. The panel has recommended removal of state’s monopoly over trade of all the other MFPs and fixing MSPs for them. Anil Garg, a Madhya Pradesh-based researcher on tribal issues, argued that government should give up its monopoly over all MFPs since it has to rest with the panchayati raj institutions alone. “Government has no right to decide an issue that comes under the gram sabha’s purview. I do not think it is too difficult to deregularise the trade. A gram sabha or a group of gram sabhas can organise the trade,” he said. The panel has suggested other states to adopt the trade arrangement of Madhya Pradesh where state agencies sell tendu leaves and give the gatherers wages, bonus and dividends. Garg, however, picked it apart saying, “The forest corporation is making huge profits from the tendu leaves trade. The model is full of irregularities. The gatherers hardly get their share of profit.” Garg has filed a case before the Lok Ayukta charging the state forest development corporation with depriving forest dwellers of sale profit. On bamboo, the committee has suggested amending the Indian Forest Act, 1927, to give it MFP status. The FRA describes bamboo as an MFP, but the 1927 Act calls it a tree. The panel has recommended incorporation of the MFP definition in the forest Act and other forest laws. “Official members on the panel think the gram sabha does not have the technical expertise to harvest bamboo. They are worried that if ownership rights of bamboo are given to forest dwellers, they will destroy the crop,” said the source. But former tribal welfare commissioner B D Sharma argued tribals are more skilled to harvest forest produce than the forest department. “The forest department can provide technical guidance if the government finds it important, but the ownership of bamboo must rest with the gram sabha,” he said. Haque and the non-official members are said to be pushing for granting the gram sabha the right over bamboo.